So many people have been acknowledging the tremendous benefits and relevance of teaching with novels and CI, that there is no need for me to say more….other than I am 100% convinced that, for me, this is the way to teach. I can not emphasize enough the phenomenal value of the TPRS novels and the novels being selfpublished (Mike Peto) as well as the original stories by people like Martina Bex. This is my second year teaching with the novel Esperanza (written by the fabulous Carol Gaab) in my Spanish III classes. Last year, both the majority of my students and I loved this book and I wrote two posts about some of the things that we did: Esperanza y Gaby Moreno and Esperanza….the final assessments. However, this year I am even more pleased with what we have done so far…..and I am a little more than 2 weeks slower than I was last year!! Yes, it has taken me twice as long to cover the same material this year that I had covered last year at this point in time. When all of those wise TPRS teachers and leaders say that “slower is better” and “make it personal”, they are oh, so right! I know now that I did not do justice to the novel last year, nor to the great ideas in the teachers guide. Matarom a más de 200.000 personas. Empezó en 1960. Duró por 36 años. Los EE.UU. tenían intereses en Guatemala…..tierras de frutas, café, etc. Los EE.UU. querían controlar la tierra. No querían a una persona comunista como presidente. En 1960, los sindicatos empezaron a luchar por una vida mejor y los derechos de los mayas y los trabajadores. General Efrain Rios Montt empezó los años más violentos. Mató a muchas personas en las montañas de Guatemala. La Guerra Civil terminó en 1996 pero la lucha y la violencia siguen (continue). Another game, called Game Gritalo facts about civil war, where the class is divided into 2 teams. Each team receives an identical set of cards (answers to the questions I will ask). Each person receives at least one card. I read the question or fact, and they had to recognize the answer, stand up and shout it! Noisy but a lot of fun. I hope these ideas may be beneficial to those of you who are also teaching with Esperanza. I’d love to hear more about what you are doing. 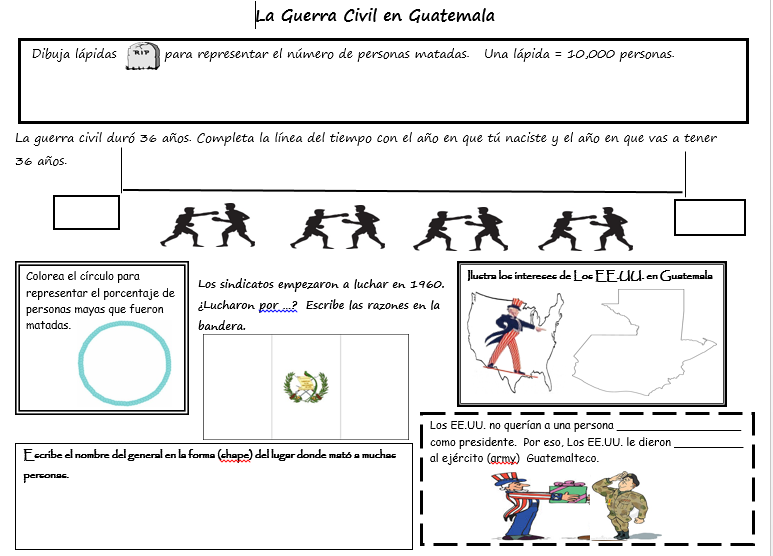 This entry was posted in comprehensible input, conversation, current events/news, Esperanza por Carol Gaab, geography, Immigration, partner work, reading comprehension, Uncategorized and tagged Comprehensible Input or CI, conversation, Esperanza (Carol Gaab), Guatemala, listening comprehension by sraslb. Bookmark the permalink. Long-time reader and love the ideas! Just FYI: It would be better to say “Mataron a más de 200.000 personas” or if you prefer passive voice, “…fueron asesinadas” or “…fueron muertas.” “Fueron matadas” is not normally used. Thanks again for sharing. Thank you for sharing, I am trying to switch over to teaching with novels but have sooo many questions, how did you make the transition ?? Thanks, Erin. I’m not sure what notes you are referring to?? Thank you so much. There are so many wonderful teachers sharing things, I just try to share some, too! Oh my goodness Sharon Birch your resources are just positively life-changing! Thank you so much for sharing these resources and ideas. I am SO glad to be teaching Esperanza in my level 3 and to be following your resources. Living on One! Tortillas – connecting to world poverty. Wow, thank you! Thank you for your very kind words! Let me know how it is going…and what you might create! I am in the process of revamping my Esperanza unit and I am SO EXCITED to see how it goes with all of your wonderful materials! I would imagine that your didn’t share your assessments (for example “Assessment 1-3” (jueves, el primero de octubre) on your wiki page because you don’t want students to be able to see them, but I was wondering if you might be willing to email them to me. I am sure that you are super busy and it is absolutely no problem if you don’t. Josh, I am so sorry that I am this late in responding. I took a break from the blog. If you would like to have the document, I would be happy to send it to you. Hi! Thanks for all of your amazing resources! Quick question… What do you think about the documentary “When the mountains tremble” by Rigoberta Menchú for giving background knowledge about the Guerra Civil? Many of the youtube videos I find are blocked at my school. Have you watched it? Do you think kids would like it? Thank you, Katie. While I have seen pieces of this documentary, I have not used it. We had considered using Bajo la misma luna, but ran out of time.